Here's a simple card for the Less is More Challenge week 161 where the colours are GREEN & YELLOW. I've used Oak House Studio's Large Rose stamp inked with Pearlescent Ivy Brilliance and coloured with Tombow markers and watercolours. 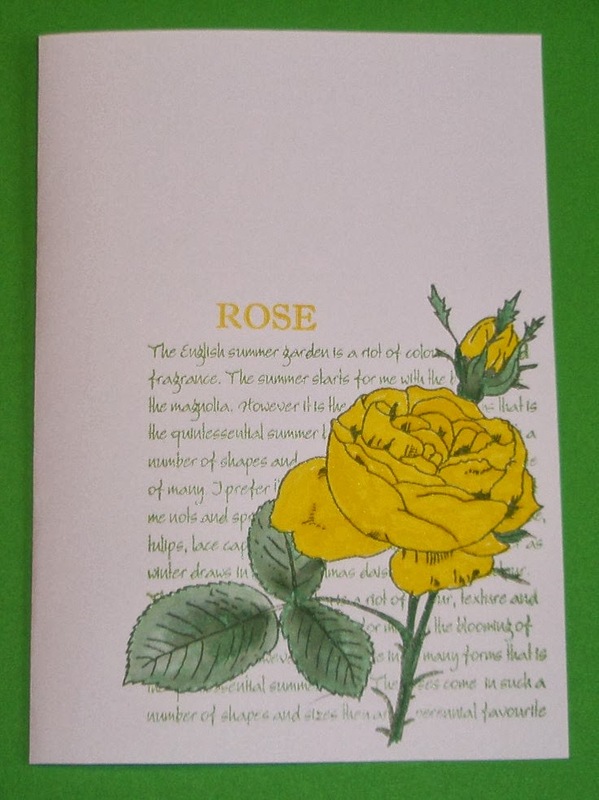 I cut a mask and overstamped the rose with the English Garden Text stamp inked with Thyme Brilliance and it's just finished with the word Rose inked with Sunflower Yellow Brilliance. Apologies for the state of the photo but it's gone dark and overcast again. Yesterday was sunny and I thought Spring had begun but I was wrong!! Thanks for looking - I'm off to look at all the other sunny bright creations!! Love your simply perfect rose! I love the text surrounding this pretty rose Elaine! Elaine what lovely spring colours!